"Pallati i Kulturës" [Palace of Culture], built 1960-1966, replacing the Tirana bazar quarter. The complex contains the "Biblioteka Kombetare" [National Library] and the "Teatri i Operas dhe Baletit" [Theatre of Opera and Ballet]. Used for opera and ballet performances by the resident companies. 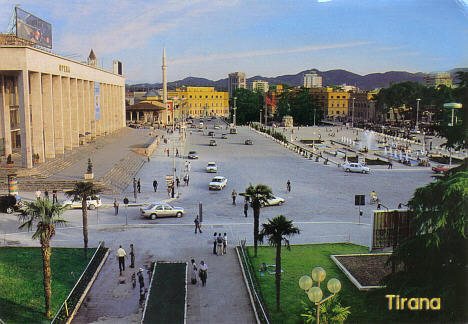 Front Text: "Tirana", inscription: "Opera"
Reverse Text: "Shqiperia - Albania, Pamje nga Tirana - View from Tirana"